After silencing the doubters at the 2007 World Cup, England failed to live up to their promise at the 2008 Six Nations with a string of indifferent performances. The match against Wales at Twickenham saw England destroyed by a consummate second half performance from the visitors, who deservedly went on to take the Calcutta Cup. 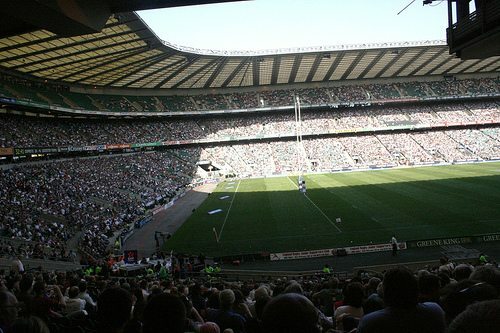 The Twickenham crowd did see improvement against the Irish on March 15th, with England scoring three tries to overturn a 10-0 deficit. So after tours abroad November will see the spotlight fall on Twickenham again with the Investec Challenge during the autumn internationals. England begin the campaign against supposed minnows the Pacific Islands but are quickly followed with visits from the Southern Hemisphere giants Australia, South Africa and New Zealand. Team Tactics are again offering first class corporate hospitality for these massive matches at Twickenham. For the Investec Challenge, we will offer two hospitality options, the Chase Bridge enclosure and the Orchard Enclosure. Both facilities offer the finest package for both client entertaining and hospitality adjacent the ground, with Category 1 reserved match seating. Prices start from only £345pp making the Autumn Internationals a fantastic option for both corporate entertaining and corporate budgets! For more details please click here or contact us on 01227 738 280.